Fifty years ago, on 28 February 1953, Francis Crick walked into the Eagle pub in Cambridge, UK, and announced something for which he would later share a Nobel Prize. "We have found the secret of life," his collaborator and subsequent fellow Nobel laureate James Watson later quoted him as saying. The pair really had figured out something very close to that. Working out the famous double helix structure of DNA was an achievement which led to countless advances and solved a mystery which had troubled scientists for decades. "When we saw the answer we had to pinch ourselves," Watson told the BBC in an anniversary interview. "Could it really be this pretty? When we went to lunch [at the Eagle] we realised it probably was true because it was so pretty." During World War II, researchers had shown that the mysterious substance which carries genes from generation to generation was DNA. But knowing that DNA was the wonder molecule did not tell them how it did its job or what it looked like. Before Watson and Crick made their breakthrough, scientists knew that the DNA molecule was made of a few relatively simple chemicals. They had the recipe for DNA, but no-one was sure how these simple chemicals combined to carry the huge amount of information required to recreate a living thing. Instead of carrying out experiments, Watson and Crick set out to think their way out of the problem. 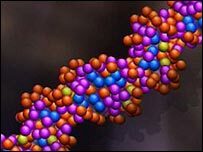 Other researchers had come up with possible models of the structure of DNA, but they were flawed. Watson and Crick came up with their own after calculating what they thought it should look like. They could not be sure about their model, though, until they had a stroke of luck. A team at King's College in London had for several years been doing experiments using the relatively new technique of X-ray crystallography. One of them, Rosalind Franklin, had taken a now famous image of the X-ray diffraction pattern from crystalline DNA showing a clear cross shape. 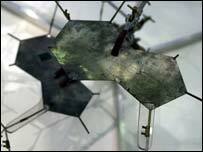 Franklin's colleague, Maurice Wilkins, let Watson see the image during a visit to London but did not tell her. Watson and Crick had already worked out what the X-ray photo of DNA should look like if their model was correct. When Watson saw Franklin's image, he knew that he and Crick were right. And so to 28 February 1953. "The discovery was made on that day, not slowly over the course of the week," James Watson said. "It was simple; instantly you could explain this idea to anyone - you didn't have to be a high powered scientist to see how the genetic material was copied." The pair published their famous paper in Nature on 25 April that year, revealing to the world the double helix and hinting how the fact that DNA has two strands allows it to create identical copies of itself. The idea took a while to attract attention, but over the decades that have since passed it became the basis for many of the famous achievements of modern biology and medicine. Watson, Crick and Wilkins shared a Nobel Prize for their work, but Franklin died in her 30s of cancer, still unaware of the decisive role of her image. Nobel Prize rules do not allow for posthumous awards. Watson said she would probably have got to the structure herself if he and Crick had not got there in the February. "If Rosalind had continued to think about DNA - she was giving it up - [she could have found the answer]. "Unknown to us at just about the time we found it, she had concluded that [DNA] was a two-chain helix. But she hadn't thought of how you would put the bases in the centre. But it would have been hard for her not to ask how you put the bases in the centre." Watson went on to be closely involved with the Human Genome Project, which set out to decipher the meaning of the billions of units of genetic information contained in human DNA. "The basis of reproduction and of life itself"
"I remember floating that whole spring"